Dec. 30 2015 about After Report of D23 EXPO Japan. Nov. 14 2015 about TDL Christmas Fantasy 2015. The last topic of 2015 is, I'd like to share an after report of D23 EXPO Japan in November. D23 Japan took place for three days in 6 - 8 November, which was a second D23 event in Japan. I'll show you a comparison of 1st and 2nd. Other Kingdom Hearts presentation included the above programs. Kingdom Hearts presentation for extra cost ¥1,500 in Nov. 2nd. 3 days ticket with All 7 shows and presentations with express lane, VIP Lounge. 1 pin, 1 plush, and 1 key-chain, and 1 Swarovski crystal stoned pen are included. Same as Class E ticket with Disney official hotel stay. But not included Swarovski pen. 3 days ticket with 3 shows or presentations. 1 pin and 1 key-chain are included. 1 day ticket with 1 show or presentation. 1 pin is included. 1 day ticket with movie program if you won the ticket by lottery. 1 pin is included. Despite the price increasing, it's so low winning rate to get these tickets. All tickets is sold for a winner of lottery in advance. I somehow won a ticket in this time. First, I introduce about a quite unbelievable pre-order special merchandise, which was waiting for me after a paying the high price ticket. There were 20 kinds of D23 merchandises, all of them were limited number, so all items were by lottery. The D23 Japan "SPECIAL" merchandises included Tsum-Tsum which sold at D23 in USA. Surprisingly, the items were so expensive and not attractive for me at all. 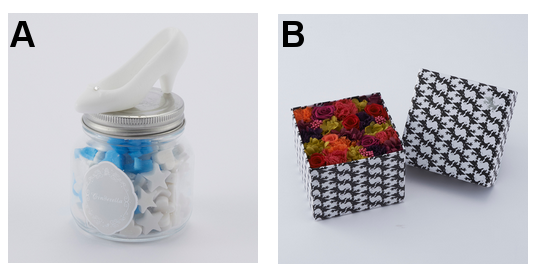 The A is "Bottled candle inspired Cinderella", the limited number is 100, and the price is ¥3,800. This item is the cheapest pre-order merchandise. The size is D6cm X H11cm. It's so small! The item B is "Preserved Flowers in D23 Expo Japan Special Box", the limited number is 100, the size is W11cm×D11cm×H9cm for ¥13,910JPY! This is the most expensive pre-order item. "K24 Gold Mickey with Diamond", limited number is 5, the Mickey is H9cm, the price is ¥1,380,000JPY! One of my favorite collectables, a mug was also not really suit me in this time. They sold only pair mugs for ¥4,600, but many couple will argue not to use inside Micky design! Where in the world people want to use drown Mickey mug? (It's exaggerate, but I think it's not good design.) And surprisingly, this mug cannot use dishwasher and micro wave!!! The most surprised point was the order closing date and the delivery date. The actual event date is Nov. 6-8, but the pre-order deadline is Oct. 2nd. And they'll deliver on nearly end of December to January. Secondly, I'll talk about the presentation and show which I could participate. I luckily went to "Coming Disney Films" the presentation, "Broadway & Beyond" the concert, and "The Secret of Disney Dubbed ~from Snow White to Frozen~". All of them hold at The Amphi Theater, (ex-Cirque du Soleil theatre) covered the special artwork sticker. "Coming Disney Films" the presentation one and a half hour. They handed out a mini blue or red lightsaber at the presentation. There are some spoilers of coming Disney film! The presenter were Dave Hollis the Walt Disney Studios' executive VP theatrical distribution and Kathleen Kennedy the president of Lucasfilm. An amazing short clip from "Moana" : A scene of toddler Moana at she shore. A little Moana played seashore alone, she wobbled toward a seashell by the surf, then the seawater parted automatically, magically for Moana to pick up another shells on the seabed. Moana played at the instant shore surrounded by the seawater wall. After a while the seawater patted her head gently, then bring her back to the shore. And glowing up Moana hold the shell and remembered the time watching the shore. →It was so beautiful clip, I think most Japanese like the tales of mysterious power of nature. I fell in love the movie in the moment. A character backbone introducing clip from "Zootopia": A scene of Nick the Fox and Judy the bunny at Elephant's Ice cream shop. Nick took a child to Elephant's Ice cream shop for treat an elephant-size ice cream. But Mr. owner elephant denied the child's request because of he isn't elephant. Then Judy came and asked the nose-scoop big ice cream for a kid. But the owner refused it again. Looking for so sad expression (so adorable), Judy blackmailed him about a sanitary hazard of the shop. (the elephant didn't use any nose cover for scooping!) So Fox father and son (looks like) finally got the giant ice cream. After that the Nick melted the huge ice, and remold for many tiny ices and sold to small creatures. Other hand, at home, Judy tried and tired to keep nice to her family through the phone. She'd like to cover up her family that she worked as parking officer for long time. →It was quite long clip and it's hilarious and beautiful film. Also they showed us already revealed a sloth at Department of Mammal Vehicles scene. I really really want to watch it!! A punchline of trailer "Captain America: Civil War": Opened the van, Scott Lang lied the back seat, then he was introduced to Steven Rogers, then he told how you’re (Captain America) lucky to get me in your team cheerfully. →I really love Natasha’s eyes for Scott at the moment, it’ so chilly. It’s a funny moment from the all serious scenes of the trailer. Steven Spielberg movie title: The title "The BFG" just appeared only. No significant information at all. Alice in Wonderland：Some short clip included a new cast, Sacha baron Cohen as "Time". Dr. Strange message from BC: The short greeting from Benedict Cumberbatch, the video was recording before the film shooting, so he couldn’t told anything about the movie progress, but he really looked forward to become new Marvel character. →I’m happy to get Benedict Cumberbatch as a hero in Disney’s Marvel world. I hope the movie will release in same day or near of USA. I’m not dubbed movie person, but I hope they will use same voice actor as BBC’s Sherlock Homes. Pete's Dragon trailer: A long, pale green and so undertone pink far brushed in the forest. →Sorry, I only remember about a glance of the very muted color fur and a modern women told about a boy who said that he wasn't alone in the forest. The celeb guest star was BB-8! "Disney Magical TV World ~Descendants~"
They handed out a small button of Mal. These programs hold at one movie theater at IKSPIARI the shopping mall. So I think everybody quite difficult to won the tickets only for 314 seats. Luckily, I won the tickets to watch a "Descendants". It was interesting young talented actor and actress with Kristin Chenoweth. But sadly, it was dubbed!! (Only the song is original.) Oh, my!! The lightsaber, a small button of Descendants, and some advertisement cards of Star Wars game. "Disney Broadway Musical & Beyond" one and a half hour. The Disney musical songs led by a below four great singers from Broadway, and with Japanese MC, Mitsuyuki Douguchi the major actor from Shiki Theater Company. It's quite wonderful, the show is little bit same taste from the special show at DVC member cruise. (Ashley Brown the OBC of Mary Poppins in the DVC shows! But my favorite Mary is Original West End Mary, Laura Michelle Kelly!! ) Most amusement song for me was "My Strongest Suit" from "Aida". Sound it normal? At the night, Josh Strickland sung the song perfectly! (The original song sung by Amneris the princess of Egypt. So we usually think it's a female song.) It was so powerful and cute. It's really interesting harmony. I wish if I could hear "Without Love" the happy song from "Hair Spray", because OBC Penny visited to Japan, and on the stage. As an aside, there is a D23 EXPO Japan official call center, I phoned that I'd like to confirm the set list at "Broadway & Beyond", but they said that "We don't know the program at all (even the guests of the show!)." I was so surprised and sad. So, sorry I couldn't figure out the song name from "King David". Did you know the OBC Bell is same as Megara in Hercules film? Did you see reunite “A Whole New World” sung by Brad Kane and Lea Salonga the original Song Aladdin and Jasmine for the first time in 23 years? You have to watch it! And don't forget the original recording!! It's so fantastic! "A Secret of Disney Dubbed, from Snow White to Frozen" one hour. Most of Disney princess Japanese voice actress gathered this stage. The climax was Matsu Takako's appearance. She's Japanese Elsa's voice and song person, she's not specialized in a powerful sing in a musical (you know the original is our RentHead's queen, Idina who has a great voice), but I couldn't forget her act of wonderful Kim in Miss Saigon. So, at the stage, she showed a great dubbing some scenes from Frozen. Did you know the original Jasmine song person and Mulan song person is same Lea Salonga, but in Japan, Ariel and Mulan dubbed by same Japanese actress, Mayumi Suzuki. In the above stage, she came to the voice of Ariel. 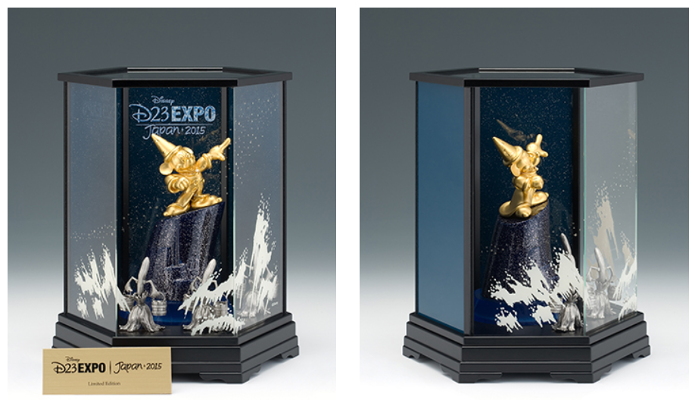 During the D23, there were two exhibitions at each banquet hall in Disneyland Hotel and Disneysea Hotel Miracosta. The title of the exhibition was "Power of Story" which included Disney Princesses, Star Wars saga, Marvel, and The Joy of Going To Infinity, and Beyond the 20th anniversary of Toy Story. The waiting line for this was average 50hours or so in everyday. But I think the contents was marginal at best. So I'll show you some photos which allowed corner from the exhibition. And this is the Toy Story corner, most of picture boards from the movies. But many people seemed satisfied with it. I realized that if want to see and experience a real D23, then I have to go D23 in USA. It's the only way. Japanese D23 tend to show no wide range for from Disney beginner to the geeks. The tickets was so geeky price, so many people rushed to D23 EXPO Japan with high expectation, I think. I'd like to know their feedback about this event in Japan. During this period, a special design Monorail ticket was sold. I didn't need it, but I bought it without any thinking. It's just another Disney magic. And the above a set of four buttons. Can you see three canned budges? That's all my wrap up of D23 EXPO Japan in 2015. Uranezu wish your Happy New Year!! TDS also started "Christmas Wishes" the special holiday event. Let's walk for a while in bright and warm lights TDS. Now the park is filled with sparkling lights, I'd like to share with you the beautiful moment. There are many Latin taste holiday decorations in Lost River Delta. It's more beautiful after the sunset. The poncho Donald & Daisy on the bridge to another side of Lost River Delta area. A road in front of "Miguel's El Drado Cantina" the counter-service restaurant is the highlight in this area. The electrical pinata can't poke, but it's so lovely, so OK. Many lights in a character punching tin cans are dancing in the Latin rhythm. So please come the nights, and feel the nice ambiance. Say good bye Lost River Delta, we go forward. It's lovely small port town, Cape Cod. Somebody decorated a main tree on the town on this heavy snow. The wheel has a nice holly wreath. This tree has not a star on the top! If you love Duffy or his pal, you don't miss the Gondola area at Mediterranean Harbor. We can see brand new painting by Gelatoni the Duffy friend. Not only the traditional decoration lights, but we can enjoy also beaming electrical things at Port Discovery. The above blue Chip & Dale are wearing elfish hat. How many holiday design lights can you find at there? Our last place is a big city, American Waterfront. A light statue of Mickey & Minnie is always popular photo place. At the first glance, the park is so still and peace. But the truth is a downtown holiday hullabaloo! How time flies! TDL and TDS the both park began annual Christmas special event. I'm still stuck in Disney's Halloween happily, but today I'd like to report you this merrily holiday season in the park. There are many colorful picture books in the entrance. Elves are bringing them to...but where, and why? Ah, this Christmas tree is made of the picture books! Yes, let's our story begin! This is a main photo location. You can enjoy your favorite Disney friends' reading time. Minnie educated Pluto, that's why he is so clever. I love Donald reading style. It's really him. So let's check how do other Disney characters spend their holiday season. These are shop window of Grand Emporium the biggest merchandise store in World Bazaar. A tall Christmas tree is a most beautiful and popular place during this season. Under a covered bazaar, the sparkling tree and a distant castle is a great scenery. At the hub the sub photo location also wonderful. "Winter had come and Bell encouraged the Beast to enjoy the season. She Showed him delights of skating as Lumiere, Cogsworth, and other servants watched. Bell thoughts as long as there Christmas, everyone could hope and feel heartwarming love. She persevere and fulfill her promise to the Beast." It's time to sing a "Something There" and "As Long As There's Christmas" from "The Enchanted Christmas". "Surf's up! And Lilo could just imagine what fun it would be if she was Santa and Stitch her reindeer! Piling her surfboard with colorful presents, Lilo was ready to share the spirit of the holidays. "Male Kalikimaka!" she called out to everyone on the beach". What a great pop-up picture book and story! I love this! There are many book scatter around these book decorations, it's fun to see the titles. The sun goes down, these location looked romantic with many lights. When the world is filled with peace and love." -"As Long As Christmas" from "Beauty and the Beast: The Enchanted Christmas"